Jersey all-rounder Anthony Hawkins-Kay will miss the inter-insular game against Guernsey because of injury. He is the only absentee from the squad already named for next month's World Cricket League Division Five tournament in Johannesburg. "We won't be thinking about South Africa on Saturday," coach Neil MacRae told BBC Radio Jersey. "We're just concentrating on winning a massive derby game away from home," he added. Hawkins-Kay was Jersey's 2016 cricketer of the year, but his absence is partially offset by the availability of Sussex batsman Jonty Jenner, who has been cleared to play despite being 12th man for England against South Africa last month. "It's a strong squad, it's got a lot of experienced players and we're really excited by the batting and bowling options," added MacRae. 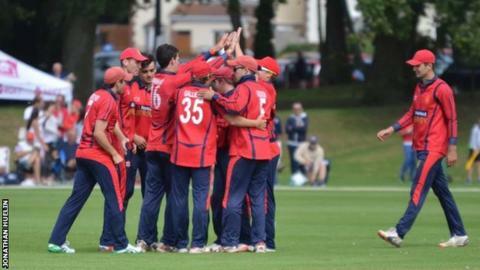 Jersey lost two 50-over warm-up games against county side Kent's second XI last weekend, the first by 38 runs and the second by six wickets. Jersey squad: C Perchard (capt), C Bisson, C Bodenstein, H Carlyon, J Dunford, L Gallichan, P Gough, J Jenner, B Kynman, E Miles, R McBey, B Stevens, N Watkins.